Of the three Goddesses that form the triple Goddess Morrigan, Badb seems to be the least understood. She calls to us from the misty battlefields of legend, disguised as a hooded crow her shrill cries heralded doom for warriors. She is the banshee, a battle furry, a prophetess, and guides souls to rest and rebirth. 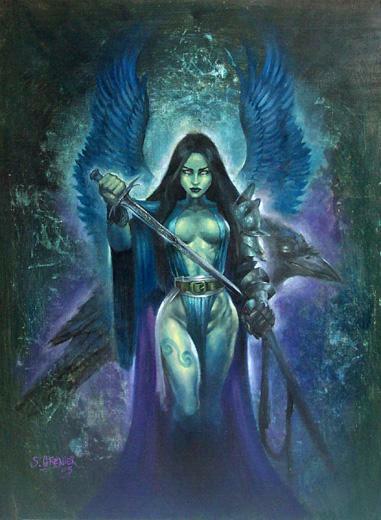 Badb stands before us with one foot in the mortal realm and the other firmly in the realm of spirits. Badb’s name means “crow” or “one who boils”. “One who boils” refers to the Otherworldly cauldron she was said to preside over. It was believed that the world would end when her bubbling cauldron overflowed, its brew spilling upon the earth. It seems odd that a cauldron, a symbol of life and the womb, should be used to bring about dead and destruction, but this story reinforces Badb’s connection to both life and death. As the dark Goddess she destroys to create anew. Badb is specifically connected to the hooded crow, a member of the corvine family with a dark gray chest and black wings, head, and tail feathers, giving it the appearance of wearing a hood. In the form of a crow she flew over battlefields inspiring battle frenzy, causing confusion and striking fear into her enemies. Battlefields were once referred to as the “Land of Badb”. When she was not watching over warriors as a crow she wandered across battlefields in the shape of a wolf. Badb’s connection to both these animals, is most likely because both animals would have been found scavenging for food on battlefields. By consuming the flesh of the fallen they were symbolically taking in the warriors’ essence/spirit. Gathering souls in animal form Badb would bring them to the Otherworlds and to eventual rebirth. As the Washer at the Ford, Badb appeared as a phantom who washed the blood soaked clothes of those about to die. Although we would assume in this dark aspect she would appear as a hag or a crone, Badb appeared just as often as a maiden as an old woman. When she appeared to the infamous Queen Maeve she is described as a “white lady, fair with brilliancy” (Leahy, The Courtship of Ferb, p.78). While today we connect black to mourning and death, white remained the color of mourning up until the time of Henry the VIII. White represented the purity of the soul and during medieval times the mourner’s hope for the soul’s entrance into heaven. As Badb often appears lamenting future deaths this is a fitting color for her. The Irish Banshee maintained both a similar appearance and function in folklore, and most likely Badb evolved over time into this faery. Like Badb the faery Banshee was also a death messenger, whose mournful wails heralded a death in the family she watched over. At first glance this phantom washer woman seems like a being to be avoided, but once we shed our fears surrounding death and change Badb can become a powerful ally. She does not cause death or disaster, but instead warns us of the consequence of our actions and guides us through transition and change. Badb teaches us that death is a part of life, and shows us how to part the veil, and draw on the wisdom of our ancestors. She can also teach us to conquer our own self-made phantoms, and confront our shadow-selves, the aspects of ourselves we fear. She speaks to us of death and destruction, yet also guides us toward healing and rebirth. Call on Badb for protection, learning about past lives, releasing negative habits and emotions, communicating with the dead and divination. The best time to work with Badb’s energies is during the new or waning moon. Dark red wine, symbolizing the blood of death and birth would also be an appropriate offering to Badb. The beginning of this invocation is based on the prophesy Badb delivers at the end of the Second Battle of Mag Tuired. Bring your blessings to me Badb! Badb, lead me towards rebirth! and to know that they are remembered and loved. depart in peace with our love and blessings. This is great info! :) Babd came to me in and have been a great help for my Martial art's training! Thank you! This was very helpful with getting to know my patron Badb. It has helped immensely with my path!